From “seed to sale,” we take a patient-first, physician-led and research-driven approach to medical cannabis care. Because: Multiple revenue streams from: Patients, Medical Cannabis, research, and big data monetization. We will be a desirable partner to the organizations and institutions conducting research into the effects and benefits of medical cannabis across a wide range of chronic illnesses. Already have strategic locations with fully licensed and educated physicians coast to coast. Capacity to expand production up to 1.2 million square foot facility. • Research and development as well as new products. • Total funded capacity of 337,000 sq. ft.
• Expansion capabilities for up to 1.38 million sq.ft. • 20,000 kg annualized production on stream by end of 2018 and 35,000 kg by end of 2019. • Largest Canadian database for medical cannabis patients. • Aleafia’s Canabo clinics have seen over 50,000 authorized patients. • Currently monetizing patient data. • Involved in multiple studies, including 1,000-pa - tient opioid-reduction study. • Immediate potential to add 20,000 sq. ft. of production space increasing total footprint to more than 337,000 sq. ft.
At our Aleafia Farms, a federally licensed ACMPR facility in Scugog, Ont., we produce standardized, pesticide-free medical cannabis for patients in need, resulting from years of expertise in its commercial cultivation. Our management team’s decades of experience in law enforcement, science and technology and corporate governance ensures the safety and security of this facility. We currently operate a 7,000-square-foot state-of-the-art indoor hydroponic facility that is contained within 76 acres of developable land interned for a planned multi-phase expansion in the near future. With our recent strategic acquisition of Canabo, which currently operates 25 clinics nationwide and is rapidly expanding, our registered patients exceed 50,000 and comprise approximately a quarter of the current estimated total Canadian patient base. To satisfy the demand of our current and future patients, Aleafia recently successfully completed a round of financing and has begun the process of planning our first 150,000-square-foot phase-one expansion of a state-of-the-art grow facility. This is part of a master plan to build up to 1.2 million square feet on our existing property. Aleafia is firmly committed to helping patients find effective treatments for chronic and serious conditions through the use of prescription cannabinoid therapy. We are uniquely positioned to create a vertically integrated model from seed to patient while expanding our grow capacity to produce standardized pesticide-free medical cannabis products for patients in need. 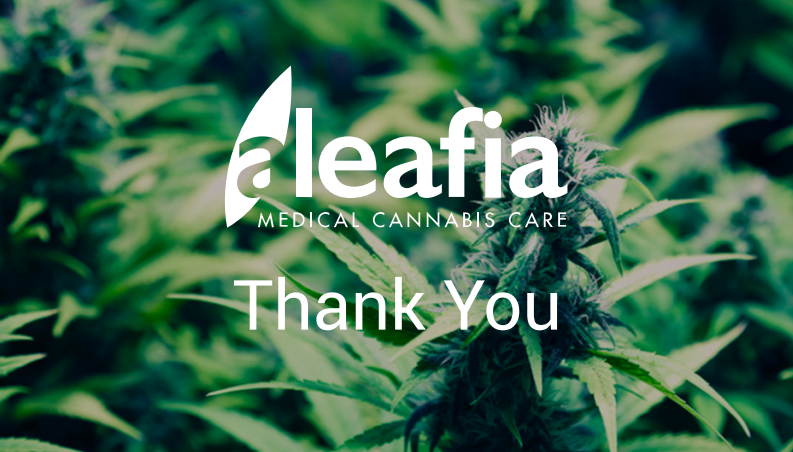 Dedicated to increasing the understanding of medical cannabis’ many benefits, Aleafia Science deploys Big Data to influence patient care. Our mission, providing the most advanced doctor and patient support, will be data based, deriving from in-depth research and development strategies on the latest industry findings. This will provide further insight into cannabis’ many uses, ensuring appropriate and safe patient consumption. Using Canabo Medical Clinic’s vast historical data, Aleafia Science’s new clinical products will achieve the highest possible efficiency rates. With extensive medical potential, Cannabinoids like THC and CBD, the key chemical components in cannabis, are extremely effective in treating many medical conditions and provide a wide range of symptom relief. For example, medical cannabis can be used to treat both acute and chronic pain caused by arthritis and fibromyalgia. It helps reduce muscle spasms caused by multiple sclerosis, Tourette’s syndrome, and Parkinson’s. Medical cannabis has long been used as an appetite stimulant for cancer patients undergoing chemotherapy, and new research shows its promise in helping to treat PTSD, opioid addiction, sleep disorders, gastrointestinal diseases, and epilepsy. While much medical cannabis research has been carried out, more is necessary. Aleafia Science will partner with other cannabis scientists to advance important breakthroughs and determine how to better propagate the medical properties of cannabis plants. We look forward to discovering new ways to engineer strains that most effectively treat particular medical conditions, ensuring our patients are guided and monitored based on the most up-to-date research. With medical cannabis research advancing globally, Aleafia Science keeps the Aleafia brand at the forefront of innovation by studying cannabis’ effectiveness on opioid dependence, medical treatment and patient recovery. As new studies are conducted, Aleafia Health will evolve and adapt with the newest scientific discoveries.